Repetition aids memory; meditation internalizes. That’s why the psalmist was confident that a steady diet of Scripture would keep him from sin (Ps. 119:11). Elderly people tend to get forgetful, and they also tend to lose certain inhibitions that once would have kept private thoughts from being advertised. Observe this phenomenon and take it to heart. Your mother warned you not to make faces, lest your face would get stuck that way. And she was right. If you smile (or frown) a lot today, your octogenarian face will show it, like it or not. Maggie Jackson made it well past the octogenarian stage. She was over ninety when we knew her—my wife and I, newlyweds, picking her up from her nursing home and bringing her to church so many Sunday mornings. She’d reminisce to us. Even though she was ninety plus, her repertoire was limited. She was getting a bit forgetful. So we listened to the same stories week after week. Her salvation as a young person; her attendance at Moody; her long and happy marriage to a pastor about twenty years her senior (he had died long ago). Whatever the story, the moral was the same: “God has been so good to me.” This statement from a lady with no family but the church, in poor health, recently moved into a nursing home. Wow. What a way to be. I like to read, to write, to think, to debate. I dread the idea of losing mental faculties as I get older. It would be great if I could keep doing then what I do today. But weighing all things together, if I can’t retain my faculties (and who knows what control we have over that? ), I really want to be like Maggie. Let me forget my own ZIP code, but don’t let me forget that God has been good. Let me babble, but let me have one coherent sentence to tell people that God has been good. The alternative is alarming. Years of nursing home ministry furnish a host of examples: people whose faces have gotten stuck. There was the lady (also past the octogenarian stage) who announced aloud, incessantly, “Mother’s dead.” Further conversation revealed that she of all her siblings had chosen to live with her mother. They all went away, but she stayed with Mother. And now Mother’s dead. To make matters worse, she once indicated she’d rather be in hell if it meant being with Mother. It was like a scene out of Lewis’s The Great Divorce. (You read it.) What lay under this mantra? Bitterness? Pseudo-heroism? Who could tell? Whatever it was, it was scary. 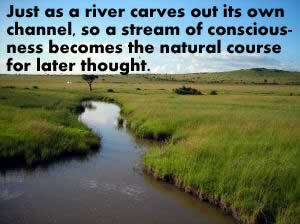 Just as a river carves out its own channel, so a stream of consciousness becomes the natural course for later thought. This happens on a small scale whenever we spend an entire day working at some task. When our heads hit the pillow, the synapses in our brain just keep firing away, and we can see the day’s task as clear as waking. (Read: don’t play video games.) Multiply that tendency by decades: if you think the same thoughts every day, you’ll have a hard time getting away from them later. Maggie Jackson remembered God’s goodness. My wife’s grandmother is forgetting a lot now, to the point of signing her name wrong. But she is as sweet and gracious as ever and retains a certain bright-eyed whimsy about her. Unfortunately, on the other side are others who have become bitter, suspicious, self-absorbed, or generally ineffectual. Observe and listen. What do their stories add up to? Are they the hero of every story? Are they the last of God’s faithful? Have they always been the wronged and misunderstood party in a conflict? Does their life’s happiness rise and fall with the promotion of some pet agenda? Have their hardships been exceptionally extenuating beyond anyone else’s experience? Are other people (rather than sin) their chief opposition? It’s a sorry and disheartening sight. One wants to hold on to hope for them, but it’s a hope that’s often dashed. They’ve been thinking this way a long time, and nothing short of a miracle can re-dig the channel. There’s a tombstone epitaph that begins, “As you are, I once was. As I am, you soon shall be.” The warning needn’t apply only to the grave. Today’s meditations become the theme for end-of-life reminiscences. What kind of stories will you be telling? Michael Osborne received a B.A. in Bible and an M.A. in Church History from Bob Jones University (Greenville, SC). He co-authored the teacher’s editions of two BJU Press high school Bible comparative religions textbooks What Is Truth? and Who Is This Jesus? ; and contributed essays to the appendix of The Dark Side of the Internet. He lives with his wife, Becky, and his daughters, Felicity and Elinor, in Omaha, Nebraska, where they are active members at Good Shepherd Baptist Church. Mike plans to pursue a further degree in apologetics.